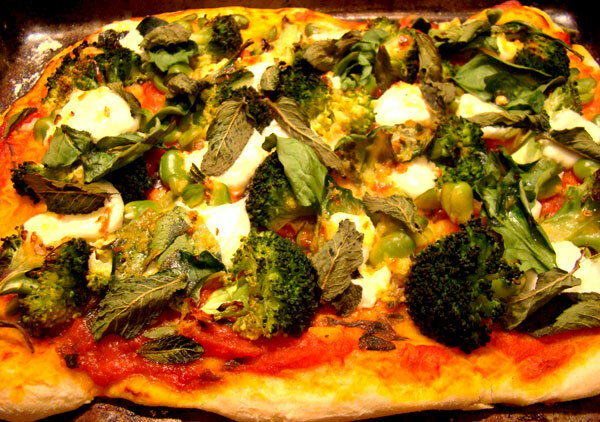 Forget dirty Dominos, there is nothing tastier than homemade pizza. It may take a little longer than picking up the phone but the results are well worth it and you can get a little creative with your toppings. It’s definitely something for the weekend, and make sure you have a good bottle of red to accompany. I have taken my pizza dough recipe from the master baker Dan Lepard’s Short and Sweet. It formed a perfect crunchy crust and was nice and chewy in-between. And my tomato sauce base is from Jamie Oliver’s Italian. The two toppings I created were pretty delicious and prove that you really can put anything on a pizza. I really recommend my go green, the combination of all that green goodness and with the mint, chilli and lemon, it could even be a detox pizza! 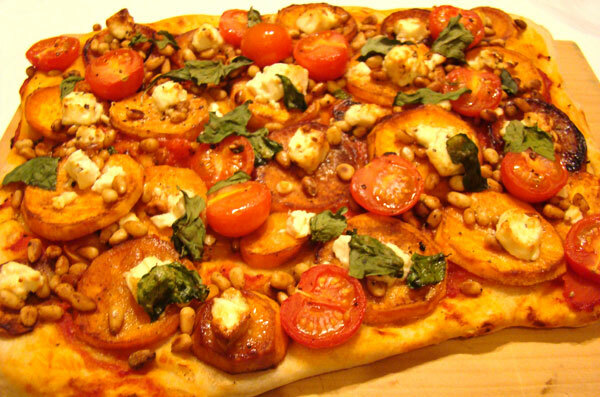 Sweet potato with pine nuts, feta and basil is one of my favourite pasta dishes, so why not put it on a pizza. Put the flour, yeast and salt in a large bowl then pour in the water and oil. Mix together evenly then cover and leave for 10 minutes. Lightly oil the work surface, knead the dough gently using one hand for just 10 seconds then return to the bowl and leave for 10 minutes. Repeat the light kneading and 10 minute rest twice more, then leave the dough until risen in volume by half, about an hour. Make the tomato sauce whilst the dough is rising. Heat a saucepan, add a splash of oil and the chopped garlic and cook gently. When the garlic has turned golden add the basil, tomatoes and a pinch of salt and pepper. Cook gently for 20 minutes, mashing the tomatoes until smooth. After the dough has rested for an hour and has risen to double its size, divide it in half and shape into balls with some flour and leave to rest for a further 20 minutes. In the meantime preheat the oven to 240C or as hot as it goes. To cook the sweet potato, place in a saucepan with a dash of water and simmer over a gentle heat. Add the honey and cook until the sweet potato begins to soften. Mix the olive oil, lemon zest and juice and chilli flakes together in a bowl. Once you have made the tomato sauce and the pizza toppings are ready to go and the dough is doing its thing you can commence the art of pizza composition. On a floured surface roll or stretch the dough out to a rectangle and transfer to an oven tray. If you have a pizza stone then good for you cos I want one! Pat around the edges of the dough to make a nice rim. Spoon the tomato sauce onto the dough and using the back of the spoon spread it evenly to form a thin covering. 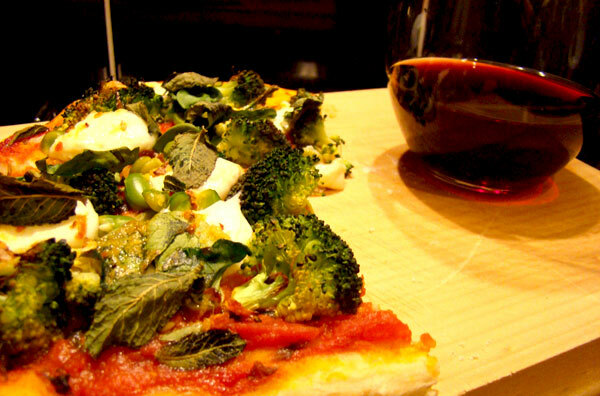 Place the toppings as neatly or not as you like, reserving the herbs. For the Go green topping pour the olive oil, lemon and chilli mixture over last. Bake the pizzas in the oven for about 15-20 minutes until sizzling and golden at the edges. Top with the fresh herbs. Serve straight from the oven with a glass of red wine! Relish the satisfaction of making the best pizza ever! Really glad that you like Dan Lepard’s recipes and Short & Sweet, but we do ask bloggers not to cut & paste from the book, and so we would ask you to edit Dan’s pizza dough recipe out of your blogpost.